Mail merge is the process of creating custom documents that combine unique information with standard text. This allows you to customise your documents individually. Main Document - This contains the text that you want to remain constant. This document also contains instructions about which parts of text to change, these are called merge fields. Data Source - This contains the text that changes from one document to the next. You data source can be a variety of different things including: a table in a Word document, Outlook address book, Access database, CSV file. It is not possible to perform a mail merge with a document that has been protected. The only exception is that you can mail merge a document that has only been protected for Tracked Changes. 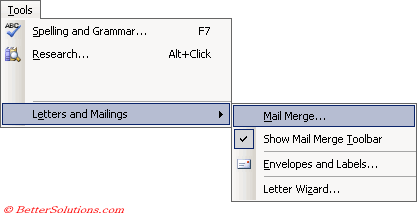 The contents of any form fields in your document will be lost when you execute step 4 of the mail merge wizard.